As bothersome as they can be at times, emotions are what make our interactions with other people interesting. That is why it’s crucial not only to observe others’ feelings carefully for social cues, but to exhibit our own in a clear, but not overbearing, way. Even here we have to be careful: behaving in a histrionic manner is just as irritating and unhelpful in interpersonal interactions as being so placid as to show no sentiment whatsoever. Who knew the way we navigate social settings every day was so complicated? Histrionic characterizes the way one expresses their emotions as melodramatic or somehow exaggerated. Although human feelings are a highly subjective matter, whenever those which one displays can be considered excessive or showy for the present scenario, they are histrionic. The word histrionic can be applied with equal facility to both actions and people. For example, you could characterize someone’s outburst in response to a mildly offensive remark as histrionic, but you could also describe the offended party as histrionic, or say that they are being histrionic. When utilized in the context of interpersonal communication, especially in one’s reaction to a striking observation or event, histrionic often implies that one’s response is not simply emotionally charged but irritated, disapproving, and even irate. For instance, if a film studio received histrionic criticism from their fans for a new movie they announced, it would indicate that the fans were aggressively and outspokenly critical. 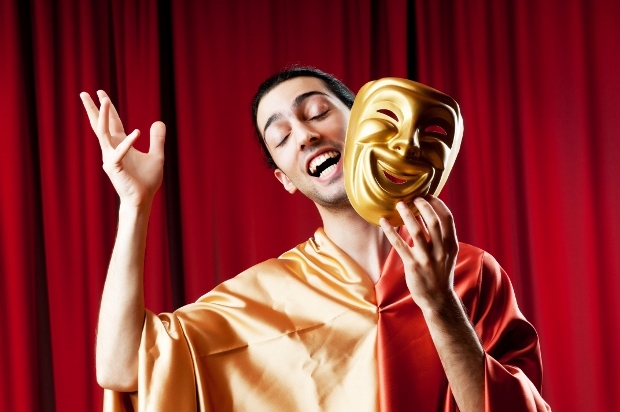 Histrionic can also be employed to signify that something is related to theater or acting. In this sense, a rehearsal for a play could be termed a histrionic exercise, or an actor could be referred to (perhaps a bit pretentiously) as a histrionic artist. Finally, histrionic can be employed in a medical context, specifically in regard to Histrionic Personality Disorder. Patients suffering from this condition are psychologically characterized as routinely striving to garner approval and attention from those around them by engaging in brazen, theatrical, or risky behavior. Thus, if an individual made a habit of flitting between short-lived, disastrously concluded romantic relationships, it is possible they might be suffering from Histrionic Personality Disorder. Whether in this sense or the primary sense, when something or someone is histrionic, the drama is running high! Example: He made excuses for his tardiness by way of a histrionic recounting of every minute obstacle that waylaid him on his way to work. Example: Long before winning his first academy award, many regarded Leonardo DiCaprio as a histrionic master. Histrionically: The adverb form of histrionic characterizes an action as being carried out in a showy or overly affected fashion. Example: He histrionically made the winning move, exclaiming “checkmate” in a self-congratulatory way. Histrionics: This noun, always employed in its plural form, encapsulates a behavior, or set of behaviors, which is melodramatic or sensational in some way. Example: Her teacher was not moved by her histrionics, insisting that she turn in her essay on time rather than granting her an extension. Histrionicism: Histrionicism describes a body of practice or tradition in the art of theater. Note that, though also a noun, this differs from histrionics, which denotes the theatrical displays themselves. Example: Theater is an ever-changing artform, as the histrionicism of even a decade or two ago seems comically outdated. Psychopaths, skillful as they are at manipulating others, have trouble with emotional regulation and generally screw up at either extreme: theatrical histrionics or cold stoicism. Kellerman notes here that, while some psychopaths delight in playing with the emotions of others, they are not very good at feigning emotion themselves, erring on the side of being too aloof or being overly affected, or histrionic. An overly dramatic telling of history would be histrionic! Theatrical declamations intended as iconic, may be received as merely histrionic. Bring out the linguist in you! What is your own interpretation of histrionic. Did you use histrionic in a game? Provide an example sentence or a literary quote.